uuid : bcc14835-166c-40e3-8a14-fb23af65c3b1 templates_id: 119592 templates_uuid: "0364b612-e99b-4cd5-906e-b4cad697e309" title: "Contract Termination Letter - Create a Letter a Ending Contract " display_name: "Letter ending a contract" meta_keywords: "Contract termination letter" description: "
Make sure you follow proper procedure when you wish to bring a contract to an end with this contract termination letter. This letter to end a contract is required to notify the other contracting party when you wish to end a contract immediately or by notice. Preparing this letter will help ensure that unnecessary damages won\'t be brought against you by the other party to the contract. This contract termination letter covers the type of notice used and the period of time before the notice takes effect. What is a letter ending a contract? Business contracts which are delivered on an ongoing basis need to be terminated correctly to avoid any disputes. Whether the contract involves regular delivery of goods, the supply of services or another open ended business relationship, it is vital that proper notification is given of a decision to bring the business arrangement to a close. A letter ending a contract provides formal notification of this decision by either party to the contract. Why do I need a letter ending a contract? Preparing a formal letter ending a contract and delivering this to your supplier or purchaser ensures that the process of terminating the contractual business relationship is properly documented. This documentation serves as valuable proof that the correct notice period (if required) was given and helps to avoid any potential disagreements. It can also be used if a contract needs to be brought to an end immediately (eg. due to a serious breach of contract). Aside from definitively ending a contract, a letter ending a contract can be used to provide notice if there is a problem (eg. poor performance if services are being supplied under the contract); it gives the other business an opportunity to put things right by a certain date if they wish to avoid termination of the contract. What are the reasons that a contract can end? There has been a breach of one or more terms of the contract. How much notice needs to be given for ending a contract? Any common intentions, or commitments made, at the outset of the contract. Certain material breaches of the contract (eg. complete failure to deliver goods or services, or to pay an invoice within a reasonable amount of time) may give rise to the termination of the contract without notice. What can I require the other party to do upon termination of the contract? Some contracts provide that, where there has been a minor breach, the offending party is given a chance to rectify the problem. In this case, a letter ending a contract can allow for the termination to be cancelled if the issue in question is satisfactorily addressed by a certain date. \r\n " created_timestamp: "2018-10-08 04:37:12.0" modified_timestamp: "2018-10-08 04:37:12.0" active: true created_by: 157 modified_by: 157 dcm_id: 265 url_slug: "Letter-ending-a-contract" meta_description: "Prepare a contract termination letter if you wish to bring a contract to an end with guidance from Rocket Lawyer. Notify the other contracting party that you wish to end the contract immediately or by notice. Try this letter to end a contract. " time_to_complete: "15 minutes"
Make sure you follow proper procedure when you wish to bring a contract to an end with this contract termination letter. This letter to end a contract is required to notify the other contracting party when you wish to end a contract immediately or by notice. Preparing this letter will help ensure that unnecessary damages won't be brought against you by the other party to the contract. 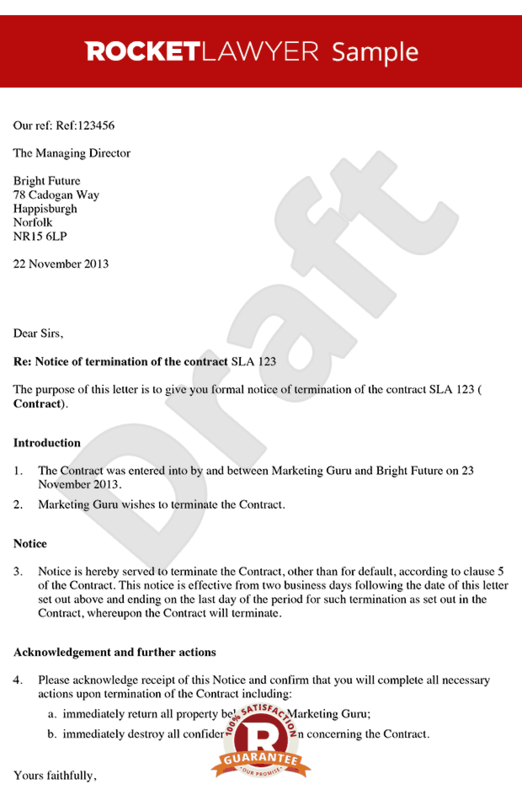 This contract termination letter covers the type of notice used and the period of time before the notice takes effect. More than just a Letter ending a contract template, our step-by-step interview and guidance makes it easy to create your document. Easily create online, download, print and sign your free Letter ending a contract in minutes. This document is also sometimes called: Contract termination letter.